The images at right show an early test of a new method of generating the "textures" that are used to add details on the surfaces of objects. 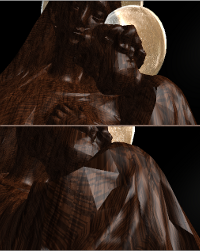 This method uses pixel shaders (programs that run within the video card and operate on every pixel [dot of color] on the surface of a polygon) to mathematically generate patterns - in this case, wood grain - based on the X,Y,Z coordinates so that the wood grain realistically extends through the entire block of wood. This mimics what occurs in nature, which can result in greater realism. It also means that there is no longer any need to try to cover complex geometric surfaces with a flat graphic image, which never works very well and is extremely time-consuming (imagine trying to wrap wallpaper around a statue or other complex object). Procedural generation also reduces memory consumption since there's no longer any need to store so many images within the video card.